Murex Shell and the Purple Dye. In my previous post about the conservation of a Minoan pithos I mentioned that many shells are often found on archaeological excavations, and that the most treasured was the murex shell from which the Minoans extracted a small gland to make their beautiful color Tyrian purple. In 2007,a bulldozer widening the highway near Pacheia Ammos quite near to where John and I work at Instap Study Center for East Crete. 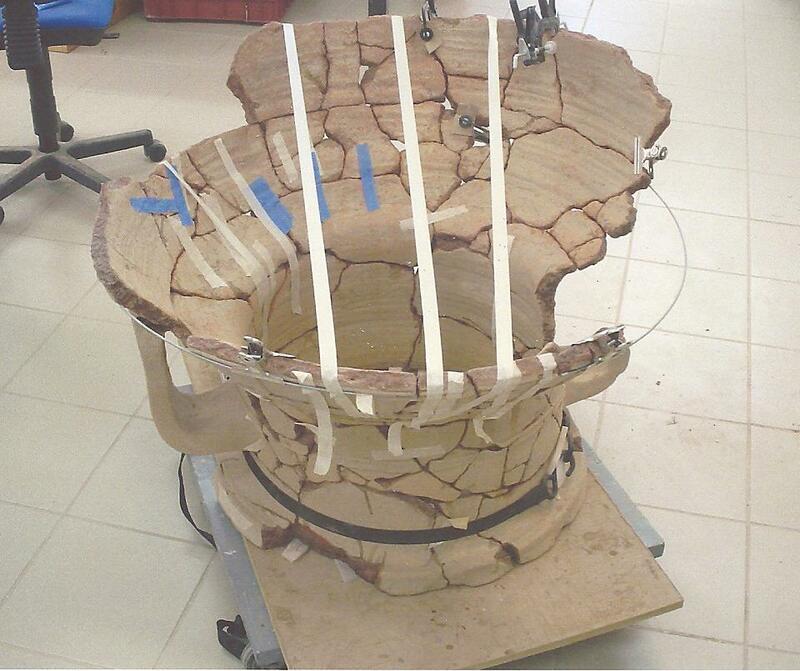 A Minoan pithos burial and a small cave filled with early Minoan lll pottery was discovered. 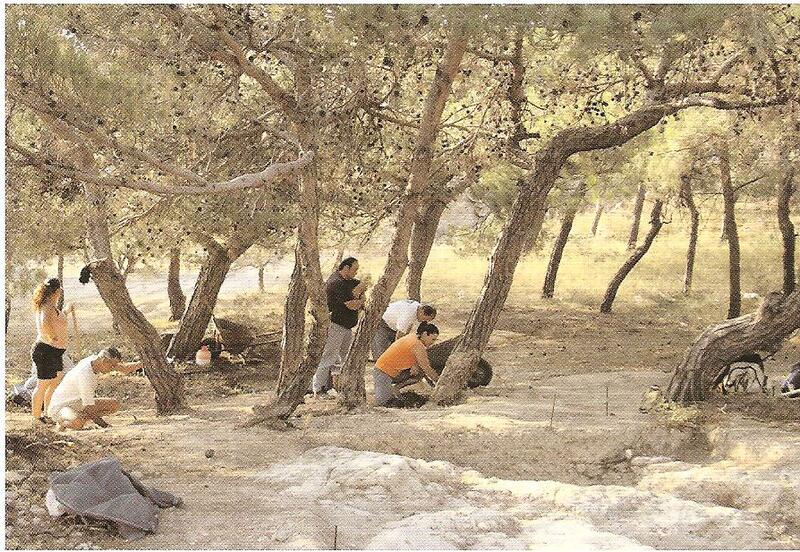 In the search for additional tombs,a series of cuttings in bedrock filled with sherds were discovered at a location called Pefka,across the road from the small cave and the Minoan burial. The 24th Ephorate excavated this site in 2007 and 2008 with technical assistance given by Thomas Brogan,Philip Betancourt,and personnel from the INSTAP Study Center. Ceramic Jar found containing Murex Shells from the Well. 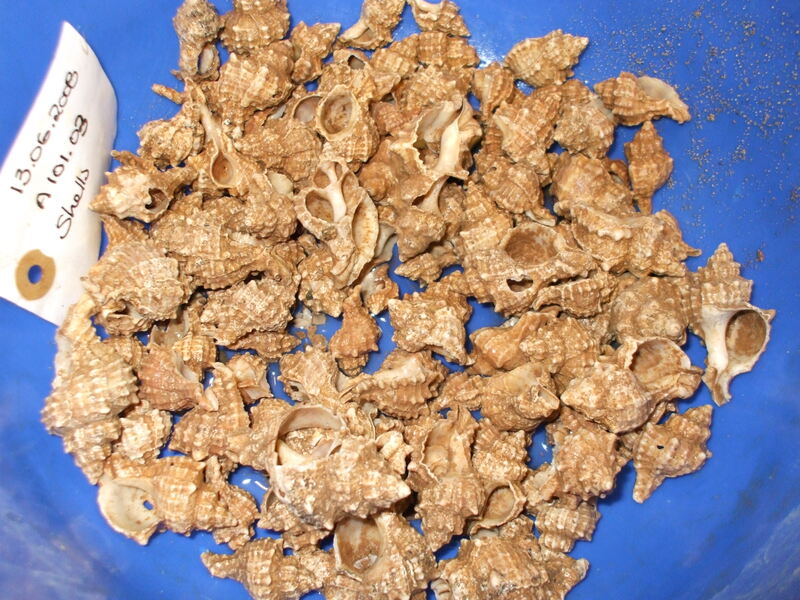 The crushed murex shells provide the clue for the use of the vats. We know from the writings of Pliny and other ancient writers that murex shells were used to make the bright violet color “Royal purple” or ” Tyrian purple”. 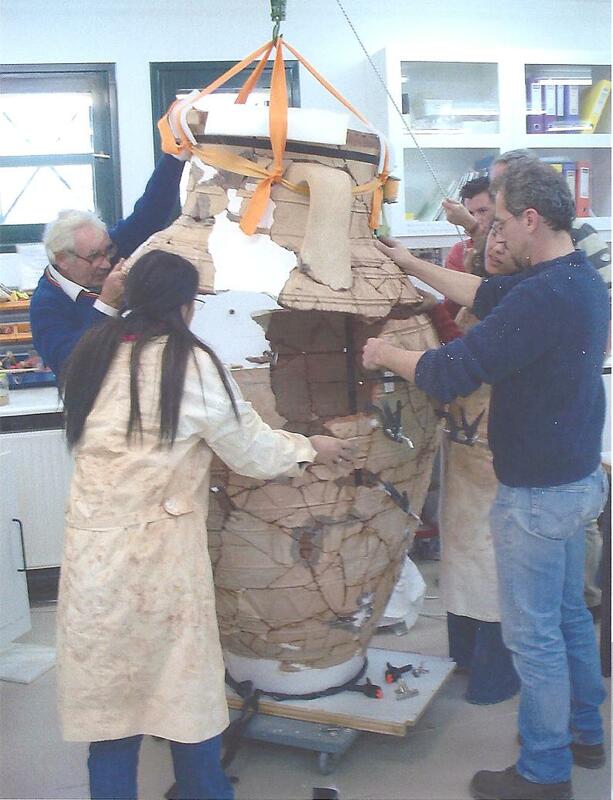 Although workshops have not been found in Minoan Crete until now, the production of purple from murex is well known from discoveries of workshops from other periods. Each animal has a tiny gland that can be removed and used for the color.Because thousands of murex shells must be collected to make a very small amount of the dye, bright purple cloth was very highly valued and the processs of preparing the dye was a lengthy one. Pliny wrote that the animals were crushed to remove the glands,then soaked in salt water for three days, and then heated for nine more days before the dye was ready to be used by pouring it into a vat to colour the wool. The Pefka workshop was set up on a limestone hill overlooking the gulf of Mirabello and the village of Pacheia Ammos. It consisted of nine vats carved into bedrock along with the mortars to crush the murex shells and a depression with a drain to wash the wool before it was dyed. Basin 1 was a circular cutting 2 metres across basin 2, a rectangular carved depression a little over 4 meters long, was the upper opening for a well that was sunk 8.5 meters deep into the bedrock. 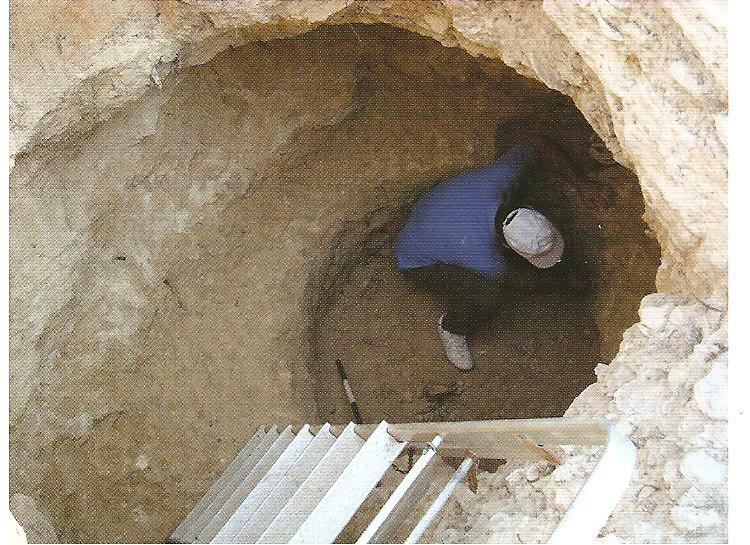 The well was designed to provide fresh water for the operation,but it was unsuccessful because a hard layer of bedrock was reached before the water table,so the well was abandonded. It was then used as a place for the dirty water from washing wool by draining the water into it from Basin 4 (because lanolin the oil in wool) floats,it can be drained off as the wool is washed. The dying would have been accomplished in a row of similar basins that form a line east to west across the hill. All the basins were a little more than a meter long.Each one had a shallow trough cut at its side in order to allow the wool to be pulled out of the vat so the extra dye would drain back into the basin. The presence of so many basins suggests the workshop was making several different colors (each dye needs its own basin to keep the color as pure as possible). Unfortunately,the buildings associated with these vats did not survive because extensive terrace building and other construction in the area,including a guard house built during World War ll,scavenged all the stones large enough for construction. 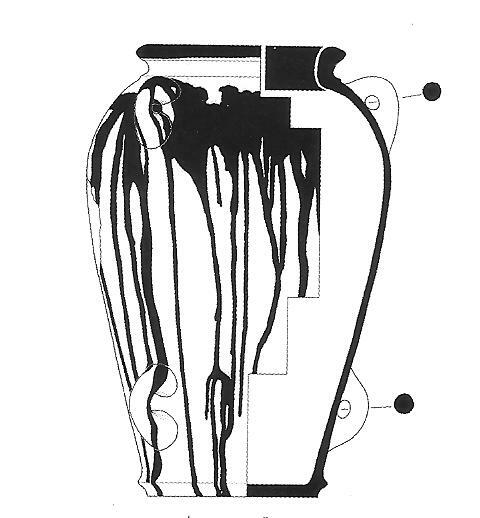 The pottery and other artifacts,however do survive,and they provide useful information on the workshop and its operation.The pottery includes large numbers of cooking pots that would have been useful in heating the dyes,as well as many jars, basins,and pithoi for storing the ingredients and the finished products. A few cups and other fine pieces show that the workers lived at their workshop.Only a few loom weights were present,so the only step in the production of cloth that took place here was the dying of the wool;the spinning of thread and weaving of cloth took place elsewhere. The scale of the workshop is palatial. The large number of basins for dying suggests a continuous operation on a large scale. If two or three persons were needed to prepare the ingredients,cut the firewood,and tend the fires for each color,wash the wool in preparation for inserting into the vats,and dry and store it for shipment,and similar groups worked on each color the workshop could have consisted of fifteen or more people, not counting additional personel for preparing food and tending to other chores. There are many Pithoi (storage vessels) found on archaeological sites in Crete. These huge pots are sometimes as tall as six foot and used to store, as well as export such commodities as olive oil, wine and other such items. Sometimes they have been found complete like those discovered at the Palace of Knossos and Malia Palace in Crete. 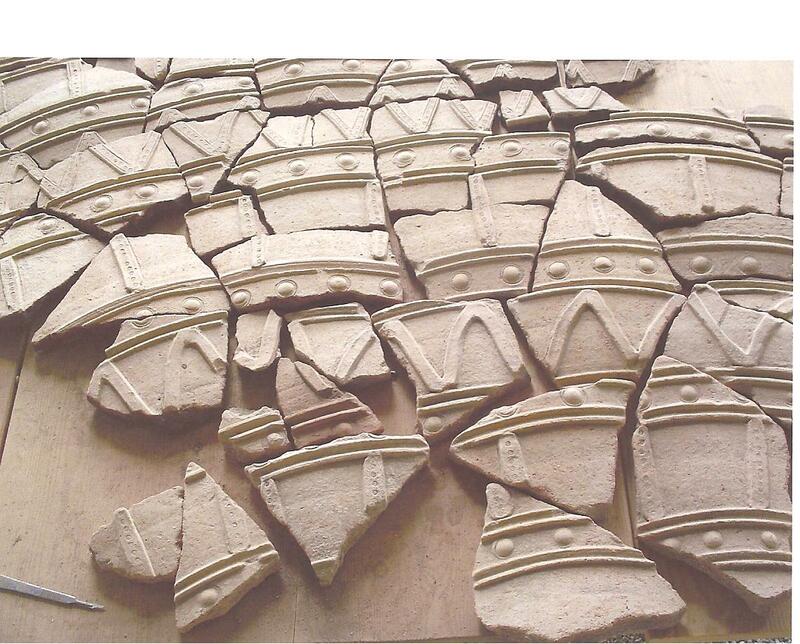 Other times they are found broken into many sherds and mixed with fragments from different vessels such as cooking pots,dishes or cups. Of course there are many other items found by archaeologists when excavating a site such as, bones,both human and animal bones, flint implements, a lamp or bowl made from stone or gypsum, a marble statue of a goddess, even metal or wooden objects. The Minoans diet included fish, so it comes as no surprise that many shells have been found on archeaological sites. The murex shell was the most treasured and is believed that the Minoans made their bright purple dye from a gland extracted from the murex itself. The Instap Study Center for East Crete is where my partner John and myself work with other archaeologists on finds from excavations around the area. There are different rooms where we work depending on what work there is to be done. John works on the huge Pithoi and I usually work on Minoan cooking pots,cups or dishes,this involves sorting many broken sherds which have first been washed, into a system where they can easily be seen when having to join them together. 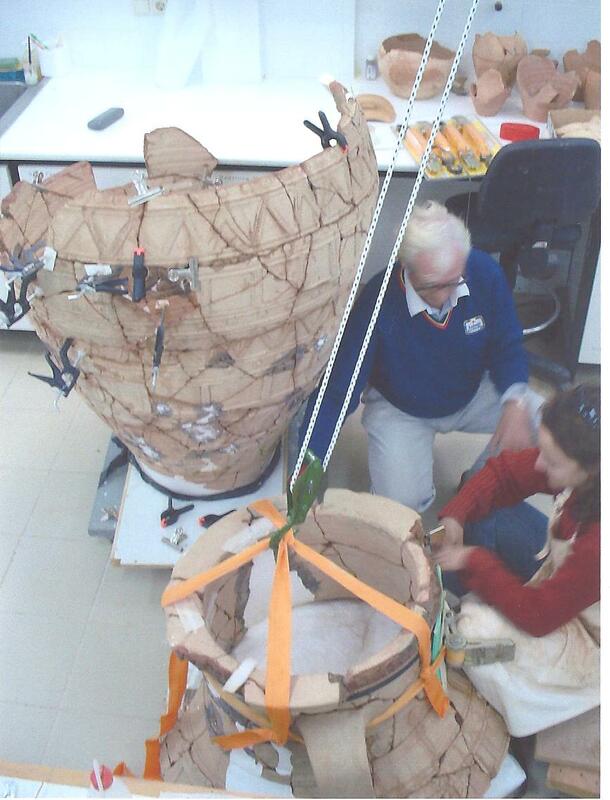 For instance, an ancient cooking pot is usually a tripod vessel so I would begin by placing all the base sherds onto trestles provided then body sherds followed by rims and sometimes handles. The body sherds are the hardest to find when trying to find pieces of the same pot, handles and feet which had broken from pots are set aside in the hope that we find more fragments to fit together. 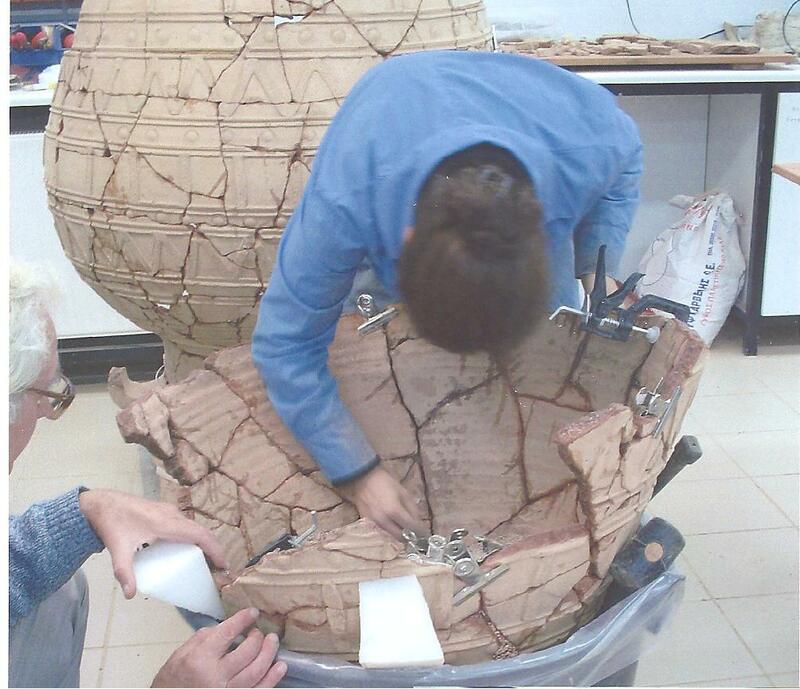 Occasionally we are lucky to discover all the fragments are from the same pot and can be put back together to form a complete vessel,when this happens it is very rewarding. Of course everything has to be catalogued for archivel purposes and for other archaeologists when a site is resumed. At The W.D.E. 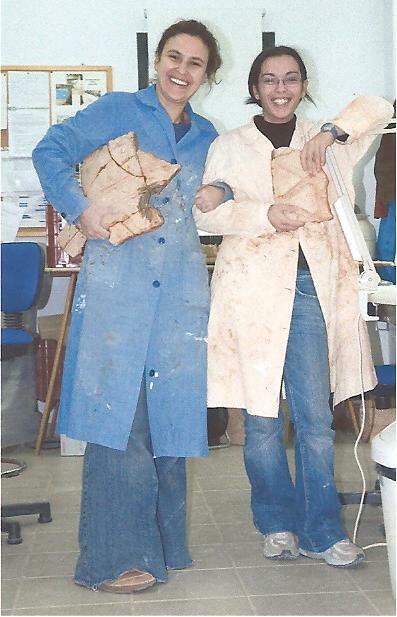 Coulson Conservation Laboratory of the INSTAP Study Center for East Crete under the supervision of Dr Stephania N. Chlouveraki,Chief Conservator. 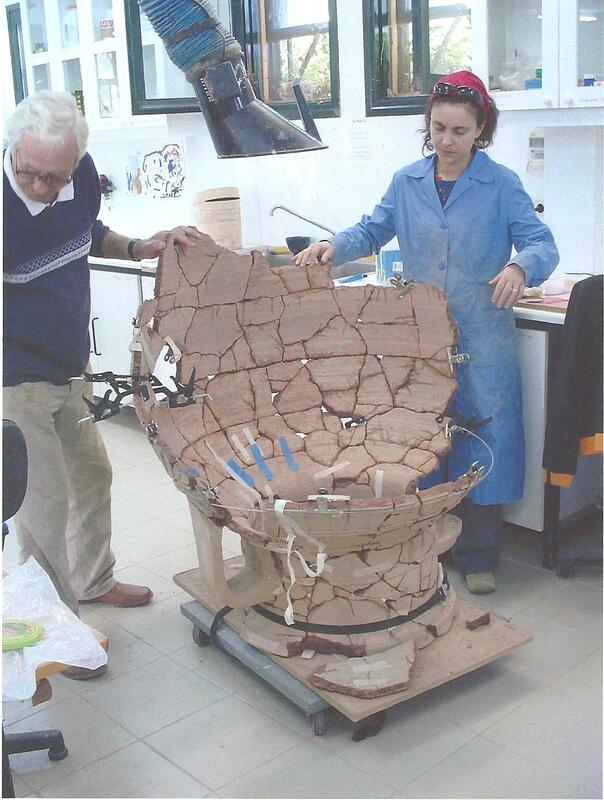 John was involved with the conservation of one of the large 4000 year old pithoi which took almost six months to reconstruct from many sherds. Here are a few pictures to give you some idea of the work involved but ‘Oh so rewarding when finished. Taking shape from the Rim. 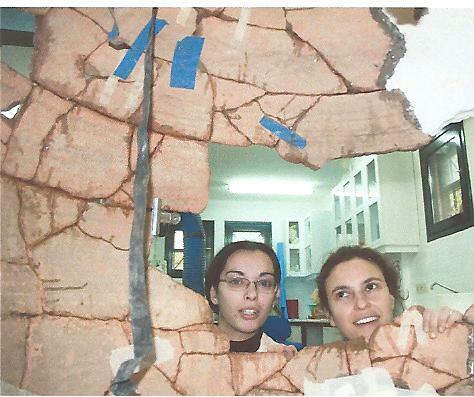 Dr Stephania Chlouveraki(Right) and Matina Tzari(Left) Just Checking. Just a few pieces left to fit. In my next post I will talk about the Tyrian Purple dye extracted from the murex so prized by the Minoans.